1990 The Adventures of Superman LOBO "Comic Book" #464 NEWSSTAND ED. 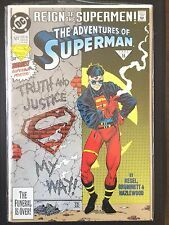 ADVENTURES OF SUPERMAN #500 NEWSSTAND VARIANT GIANT-SIZE DC 1993 NICE!!! 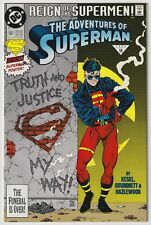 DC COMICS JUN 1993/15 THE ADVENTURES OF SUPERMAN #501 REIGN SUPERMEN NO POSTER! This page was last updated: 18-Apr 18:13. Number of bids and bid amounts may be slightly out of date. See each listing for international shipping options and costs.